Exactly half of all Americans who have fallen victim to ransomware have fulfilled the attackers’ demands and paid the ransom. This is just one of the findings of Ransomware. 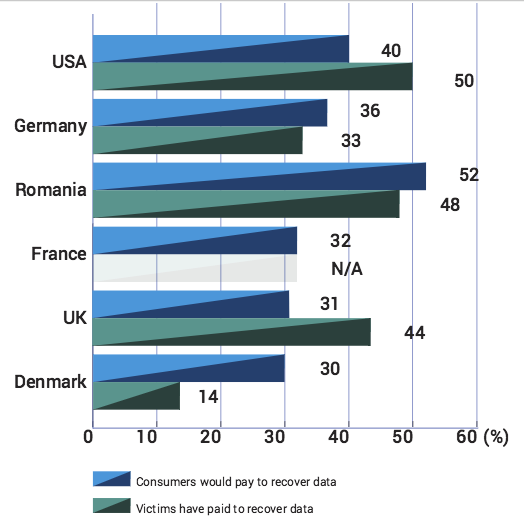 A Victim’s Perspective: A study on US and European Internet Users (PDF), a report conducted by Bitdefender in November of last year. For its study, the security firm spoke with just over 3,000 web users located in the United States, France, Germany, Denmark, the United Kingdom, and Romania in an attempt to understand how a victim of crypto-ransomware responds to an infection session. Bitdefender found that more than a fifth (21.21 percent) of all phishing emails laced with crypto-ransomware target the United States, making Americans the most sought-after targets for malware sample like Cryptolocker2 and CryptoWall 4.0. This might explain why half of U.S. respondents answered that they have paid the ransom, whereas 40 percent said they would meet the attackers’ demands were their files to be encrypted. Overall, 50 percent of respondents everywhere said that they would pay for the return of their files. The British were willing to pay the most at $568 per each infection session, the study found. When they were willing to pay, respondents said they were interested in recovering their personal documents first and foremost, Bitdefender determined, followed by personal photos and job-related documents. Last year, the FBI stated that paying the ransom was sometimes the easiest way for a victim to regain access to their files. With that in mind, it is important that users regularly back up their data. These backups could help a victim recover from a ransomware attack without requiring them to pay the ransom fee. For more information on how you can respond to and even prevent a ransomware infection, please click here. Security researchers have disclosed a vulnerability in Nissan LEAF cars that could potentially allow hackers to access data on recent trips, as well as tamper with the heating and air-conditioning systems. The flaw appears when the electric vehicle communicates with its companion app – NissanConnect EV – which drivers can use to view and control certain features, such as checking driving range and state of charge, or adjusting the in-car climate. However, researchers Troy Hunt and Scott Helme recently discovered the mobile app’s communication with the car is entirely unauthenticated. With just the Nissan’s VIN (Vehicle Identification Number), an attacker could potentially send the same commands and requests via the Internet. Even more alarming is the fact that this unique code is usually made visible through the car’s windshield. Although the issue is not life-threatening, Hunt warns that hackers could still exploit the app to cause mischief like running down the car battery, leaving the heater on for hours or simply compromising the user’s privacy. “Nissan needs to fix this,” wrote Hunt in a blog post. “It’s a different class of vulnerability to the Charlie Miller and Chris Valasek Jeep hacking shenanigans of last year, but in both good and bad ways. Good in that it doesn’t impact the driving controls of the vehicle, yet bad in that the ease of gaining access to vehicle controls in this fashion doesn’t get much easier – it’s profoundly trivial,” said Hunt. “As car manufacturers rush towards joining in on the ‘internet of things’ craze, security cannot be an afterthought…” said Hunt. The reason we have passwords is to make it harder for attackers to get to our stuff. Ideally, strong passwords ensure that we’re the only ones who can access our email inboxes, our social media profiles, our bank accounts, and our Amazon shopping carts. Unfortunately, passwords by themselves aren’t always strong enough to accomplish that goal. Don’t believe me? Just head on over to Pastebin and spend some time searching for pastes that contain user account + password combos. It won’t take long for you to find them. Trust me. Better yet, head on over to Google News and do a few searches on password breaches and forced password resets. Amazon, Comcast, Linode, LiveStream,WordPress… even Hello Kitty isn’t safe. HELLO KITTY! The worst part? Users often find out about these breaches after it’s too late, after the damage has been done. It would really be swell if we had a way to make it even harder for attackers to gain access to our online accounts, wouldn’t it? Ladies and gentlemen, I give you… TWO FACTOR AUTHENTICATION! The short version: Some of the most popular websites have added another layer of security that makes it a lot harder for attackers to get to your stuff. The cool part is that these same websites have worked really hard to make sure this extra layer of security isn’t a huge hassle for legitimate users. If you turn on two factor authentication, you’ll be asked to plugin your username, your password, and another factor to prove you really are who you say you are. In many cases, that other factor is a short numeric code texted to your smartphone, a random number generated by an app like Authy or Google Authenticator. 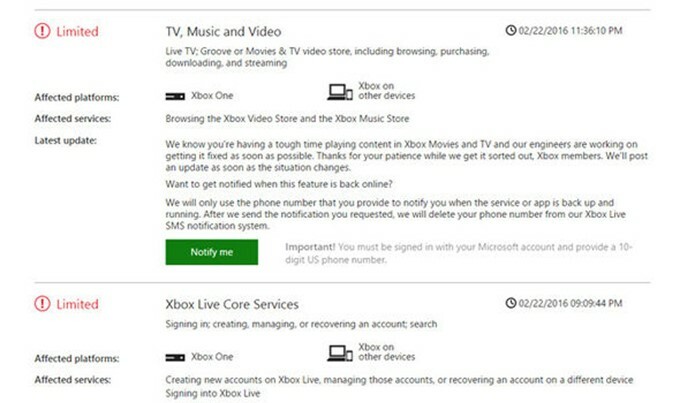 To make it even more convenient, some of the websites will remember your computer as a trusted device, meaning that you don’t have to plug in that second authentication factor every time you login from your home machine. I HIGHLY recommend that you turn this on wherever possible. Attackers are getting more and more sophisticated, and people who start using two factor authentication now are less likely to be impacted by an account compromise. If this sounds like something you want to check out, here are links that will help you enable two factor authentication on a number of sites that you’re probably using today. If you have a site that isn’t on this list, check out TwoFactorAuth.org. Their list is INSANE, and they’ll help you tweet companies who need to get with the times. “We can’t find any evidence of a 600Gbps DDoS attack taking place,” said Darren Anstee, chief security technologist at Arbor Networks, in an email toZDNet. Netflix malware and phishing attack campaigns are contributing to the rise of a black market built around the sale of stolen credentials. Lionel Payet, a threat intelligence officer at Symantec Security Response, explains in a blog post how he came across two unique attack campaigns that are targeting users of the popular web streaming platform. The first involves malicious files posing as Netflix software that, one executed, download the banking Trojan Infostealer.Banload onto victims’ machines. The trojan, which has been disproportionately used in attacks centered in Brazil, is not dropped by drive-by downloads. Users must install it onto their computers. They can be tricked into doing so by attackers who link the malicious executables to ads offering Netflix access at a discount rate. The second attack campaign involves the use of phishing emails. The researcher identifies one phishing campaign in particular that warned Danish users of an incorrect processing of their monthly payment and urged them to log in to their accounts. A link provided in the email redirected victims to a fake login page. 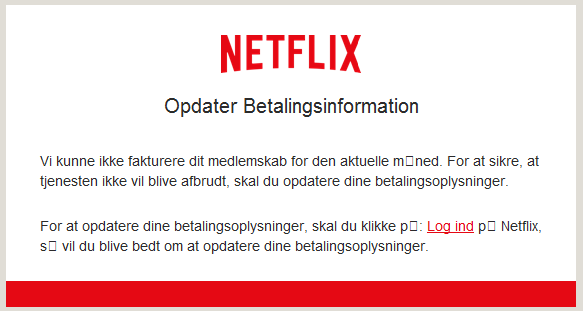 In both the malware and phishing campaigns, attackers steal Netflix users’ account credentials, which in turn end up on black market sites. Most of these sell access to the compromised accounts, which in a way assumes the function of an underground streaming service. Others, however, involve tools that use stolen subscriptions or payment card details to create new Netflix accounts, which can be sold on other black market websites. Acknowledging these threats, Payet urges users to not click on any ads offering cheap Netflix access. Users should also exercise caution around suspicious email links, and they should always review their monthly credit card bills for suspicious transactions. This news follows on the heels of Netflix’s announcement that it would crack down on the use of proxies among its members. Kingston Digital, one of the world leaders in memory products, has released DataTraveler 2000 encrypted USB Flash drive. This portable memory device offers best-in-class security features like hardware encryption and PIN protection with an onboard keypad. The device is expected to ship in Q1 in 16GB, 32GB and 64GB capacities. 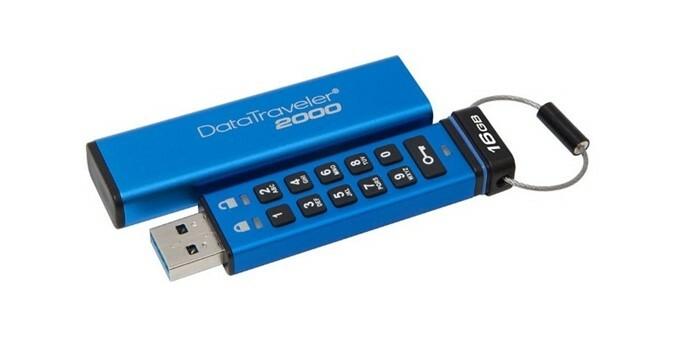 Kingston DataTraveler 2000 USB — PIN protection, AES 256-bit data encryption, resists bruteforce attacks. Are you excited about this upcoming USB drive from Kingston? Tell us in the comments below. The attacks may have been test runs for the devastating power-company hacks. The attackers who crippled Ukrainian power operators in December probably committed attacks shortly before against a mining company and a railway operator, Trend Micro said Thursday. The security company said its latest technical research shows that the same malware — dubbed BlackEnergy and KillDisk — were probably used in the earlier actions. It didn’t name the targets of those attacks, which took place in November and December. “There is remarkable overlap between the malware used, infrastructure, naming conventions, and to some degree, the timing of use for this malware,” wrote Kyle Wilhoit, a senior threat researcher. The cyberattacks against the two utilities, Prykarpattyaoblenergo and Kyivoblenergo, have caused widespread concern in the security community, which has warned that attacks against industrial control systems could cause great damage. Kyivoblenergo said 80,000 customers lost power for six hours after 30 substations went offline. Service was restored after operators took manual control and closed circuit breakers. The malware used in the attacks, known as Black Energy, has been linked by the security firm iSight Partners to a group nicknamed the Sandworm Team, which is suspected to be from Russia. Relations between Ukraine and Russia have been tense since Russia annexed Crimea in 2014. BlackEnergy probably infected the large mining company, according to Wilhoit. The malware in the earlier attack communicated with the same command-and-control servers as the tools that infected the two utilities, he wrote. The mining company also was infected with several versions of KillDisk, which is designed to make a computer unusable by overwriting the Master Boot Record (MBR), the first sector of a PC’s hard drive. KillDisk also overwrites files with junk data. “While none of the exact samples in the prior utility attacks appear to have been used against the mining organization, the specific samples witnessed perform the same exact functionality as those witnessed at the Ukrainian power utilities, with very little difference,” Wilhoit wrote. There also are indications that KillDisk affected the railway operator. Trend Micro believes that BlackEnergy was probably on the railroad’s systems, too. “The infections in the mining and train companies may have just been preliminary infections where the attackers are just attempting to test the code base,” Wilhoit wrote. Apple CEO Tim Cook said his company will fight a court order, granted to the FBI that would compel the manufacturer to build what it calls a “master key” for the data held on iPhones. The vulnerabilities would have given attackers access to children’s names, birth dates, gender and even location. Over the past two years security researchers have shown that many Internet-connected “smart” devices have not been designed with security in mind. This also seems to be the case for their back-end systems. The latest example are flaws found in the Web services operated by smart-toy makers which could expose children’s personal information and location. In the case of Smart Toy devices, the researchers found that the manufacturer’s Web service did not properly validate request senders. Through the exposed APIs, they could enumerate all customers and find their toy ID, name, type and associated child profile; they could access all children’s profiles, including their names, birth dates, gender and spoken languages; they could find out when a parent or child is interacting with their toy and could associate someone’s toy with a different account, effectively hijacking it. The hereO GPS watch allows members of a family to keep track of each other’s location and activities and to perform other interactions such as messaging. The back-end Web service used by the platform provided an API for inviting a person to an existing family group, but did not perform proper verification. The vulnerability could have allowed an attacker to add a rogue account to an existing family group and to confirm its addition on the family’s behalf. The attacker would then have access to every family member’s active location, as well as location history, and could abuse other platform features, Stanislav said.